Table 1and Figure 1summarize CO2 flows from the total life cycles of biodiesel and petroleum diesel and the total CO2 released at the tailpipe for each fuel. The dominant source of CO2 for both the petroleum diesel and the biodiesel life cycles is the combustion of fuel in the bus. For petroleum diesel, CO2 emitted from the tailpipe represents 86.54% of the total CO2 emitted across the entire life cycle of the fuel. Most remaining CO2 comes from emissions at the oil refinery, which contribute 9.6% of the total CO2 emissions. For biodiesel, 84.43% of the CO2 emissions occur at the tailpipe. The remaining CO2 comes almost equally from soybean agriculture, soybean crushing, and soy oil conversion to biodiesel. 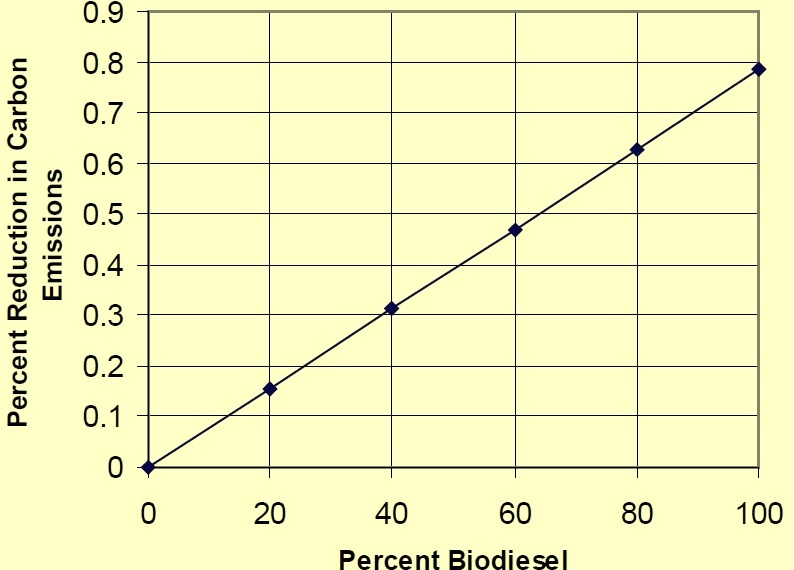 Figure 2 shows the effect of biodiesel blend levels on CO2 emissions. *Net CO2 calculated by setting biomass CO2 emissions from the tailpipe to zero. At the tailpipe, biodiesel (most of which is renewable) emits 4.7% more CO2 than petroleum diesel. The nonrenewable portion comes from the methanol. Biodiesel generates 573.96 g/bhp-h compared to 548.02 g/bhp-h for petroleum diesel. The higher CO2 levels result from more complete combustion and the concomitant reductions in other carbon-containing tailpipe emissions. 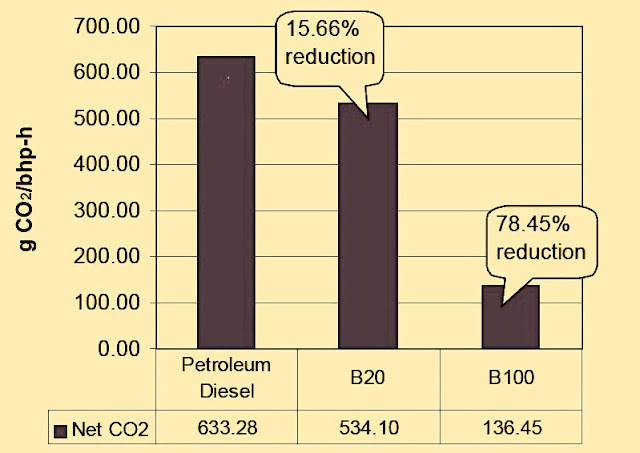 As Figure 1 shows, the overall life cycle emissions of CO2 from B100 are 78.45% lower than those of petroleum diesel. The reduction is a direct result o carbon recycling in soybean plants. B20 reduces net CO2 emissions by 15.66%.